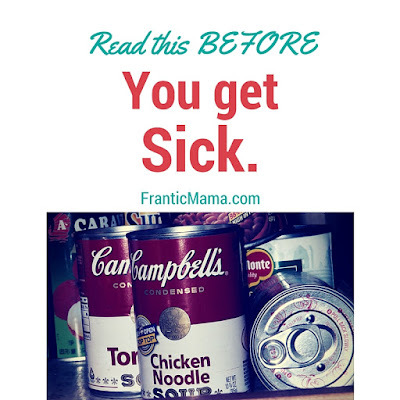 Frantic Mama: Read this BEFORE you get sick! Remember the scary movie Misery, with Cathy Bates? I experienced a small chunk of that fresh Hell this past weekend when my son, my daughter, and-- of course-- I got sick. Not just "runny nose" sick. Not just "cough, cough, oh, I feel a little sick." But real, live Stomach Bug sick. Yeah, that kind. On top of it, my husband was out of town for work. Across the Atlantic ocean. I was solo, fighting my own brutal battle while putting my kids health and comfort first (as mothers do. sigh). Oh, the misery! The misery! A few things did help the situation, and I am stocking up on these items again now so that when the next time this happens-- because it will happen again-- I want to be prepared. Nothing quite ups the misery factor than dragging two sick kids to the drugstore when you feel like a lump. Here's what to have in your pantry to avoid the madness. Cans of chicken noodle soup or broth. Black tea and ginger tea. Extra credit: keep a stash of dry white rice in your house (the wheat has too much fiber and could upset your stomach more). I lived on the above for a few days. My kids also managed to consume toaster waffles and applesauce. Sick Day Toys/Activities: Keeping a stash of sick day toys in a cabinet is borderline genius if you ask me. Coloring books, crayons, a couple new kids DVDs, play-doh, and books are all good bets. Keeping the kids occupied inside all day when no one is feeling well is exhausting, but having a few "new" things can help. Peppermint oil: Whether or not you've joined the essential oils bandwagon, peppermint oil certainly can't hurt the situation, as it is supposed to help with nausea. I added drops of it to the kids humidifiers and mixed it with tea tree oil for the diffuser in the kitchen. I really do think it helped. At least my house smelled better. Heating pad: I had terrible sharp pains in my stomach, and the heating pad helped. 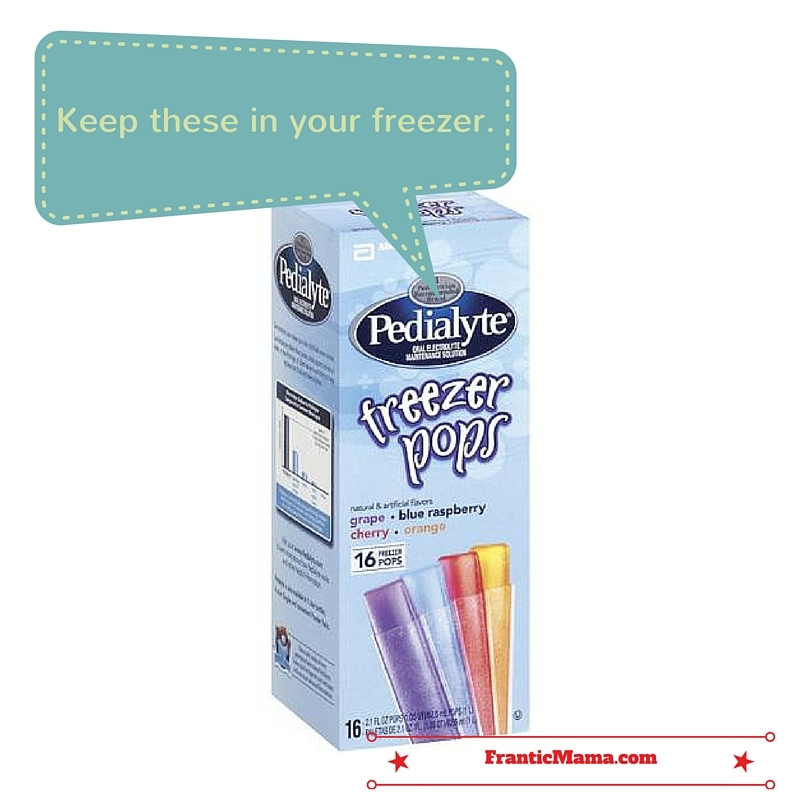 Pedialyte Freezer Pops: I credit my sister with this one, who has told me to buy them for years. 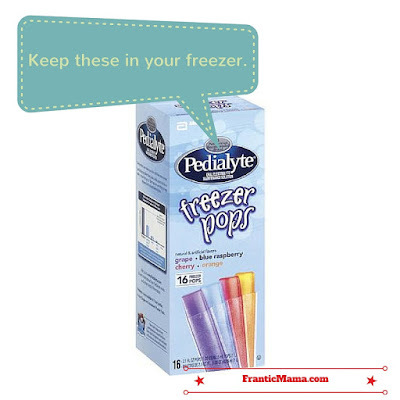 Store them at room temperature and put them in the freezer when needed; the kids think they are having a treat while getting rehydrated with Pedialyte. One last help, that money just can't buy, were the offers from a few good (very good) friends to help us-- whether it was to bring by some food or even just to check in via text. It kept me [somewhat] sane. What has helped when you and your kids have been sick? What would you add to this list? Oh! Mamma isn't allowed to get sick! It can get rather overwhelming,I know. Black tea and ginger ale would be my hydration favorites too. For the kids,I depend on chilled fresh coconut water and roasted cumin-mint buttermilk. Pre/probiotics help too. Peppermint-y house smells oh so wonderful. Board games are fun when everyone is down. Scrabble(junior) found its way into our home this way. 'Pictionary' offers lovely distraction. ' Where's Wally?' spotting books are a great companion in bed. I hope you get the much needed breather!! And yes, I finally ordered my copy of ' The highly sensitive child' . Eager as a beaver to read !! "Chilled fresh coconut water?" "Roasted cumin-mint buttermilk?" Swati, will you please come care for me next time I'm sick?! :). Those sound delicious! I can't wait to hear what you think about the book!!! I would, I would:):) but I really do hope bugs stay off you and yours! With kids in school, sick spells are such a routine. They will be spaced farther though as children grow!! Healthy vibes your way.